Azam Khan (born 14 August 1948) is an Indian politician, one of the founding members of the Samajwadi Party and a member of the Seventeenth Legislative Assembly of Uttar Pradesh of India. He was also the senior most Cabinet Minister in the Government of Uttar Pradesh and has been a member of the legislative assembly for nine terms from Rampur assembly constituency. Azam Khan was born in Rampur, Uttar Pradesh, India. He attended Aligarh Muslim University and attained Bachelor of Laws degree in 1974. Khan married Tazeen Fatma in 1981 and has two sons. Prior to joining politics, he worked as a lawyer. Azam Khan has been an MLA for nine terms; all from Rampur assembly constituency. He was also a cabinet minister in the government of Uttar Pradesh. Khan is currently a member of the Samajwadi Party but has been a member of four other political parties between 1980 and 1992. During his first term (8th Legislative Assembly of Uttar Pradesh), he was a member of Janata Party (Secular). During his second term (9th Legislative Assembly of Uttar Pradesh), he was a member of the Lok Dal. Khan was a member of Janata Dal during his third term (10th Legislative Assembly of Uttar Pradesh). 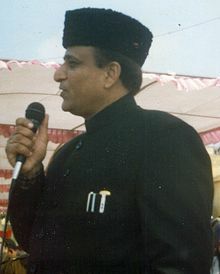 In his fourth term (11th Legislative Assembly of Uttar Pradesh), Azam Khan was a member of Janata Party. Since 1993 (his fifth term and 12th Legislative Assembly of Uttar Pradesh), he has been a member of the Samajwadi Party. Azam Khan also was a post holder in Samajwadi Party however on 17 May 2009 he resigned from the general secretary post of the party. However, during the 15th Loksabha elections, his opposition to the Samajwadi Party candidate, Jaya Prada, and the surrounding controversies resulted in a crisis in the party, and on 24 May 2009,as per his statement he was expelled for six years but according to party chief he himself resigned . The Samajwadi Party later revoked his expulsion and he rejoined on 4 December 2010. After his successful win in 2014, Khan has been given ticket from Rampur constituency by the Samajwadi Party for the Lok Sabha elections of 2019. During the 2014 Lok Sabha elections, Azam Khan caused several controversies which sparked attention from the media. He said, referring to the Kargil War: "The peaks of Kargil were conquered not by Hindu, but Pakistani soldiers.” This was criticized by the Indian media and an FIR was lodged against him. He refused to apologize for this and later accused the Indian Election Commission of bias against him because of his religion. While addressing a rally in Sambhal, Azam Khan appealed to people to take revenge against the “murderers of Muzaffarnagar.” Third, Azam Khan insulted his political opponent Narendra Modi, saying: "We don’t want your sympathy, elder brother of a dog’s son." On 11 April 2014, Azam said that Sanjay Gandhi and Rajiv Gandhi had been punished by Allah for "forcible" sterilisation during the Emergency and "shilanyas" at the disputed site in Ayodhya. He also commented on Narendra Modi's acknowledgement of his marriage, saying "the person who could not live with his wife, how can he live with the country?". It has been alleged, that he pressured the police to not arrest people from the Muslim community during the 2013 Muzaffarnagar riots. Later he was in the news, when some of his buffalo were stolen, when sniffer dogs and a team of 100s of policemen were deployed for the job. In July 2014, Shias in Uttar Pradesh asked for his removal over accusations of bribery. On 21 November 2014, Azam Khan commented that Taj Mahal should be handed over to the Wakf board. He also said, apparently sarcastically, that the huge birthday funding of Netaji came from Dawood Ibrahim and the Taliban. He was also accused of having called Bharatmata a "dayan" (witch). He later clarified that he said it in the context of his religious beliefs. In 2013, Dalit writer and social activist Kanwal Bharti was arrested by Rampur Police (constituency of Azam Khan) for a Facebook post against Khan. Bharti, was booked under Section 66-A of the Information Technology Act. In 2013, when attending an event at Harvard for Kumbh mela, Azam was detained at the Boston airport after which he cut short his trip protesting the long and humiliating frisking process by the authorities. In 2015, a teenage school boy was also arrested under Section 66-A of IT Act for an "objectionable" post on Khan after Khan’s media-in-charge Fasahat Ali lodged an FIR. Later, the Supreme Court sought an explanation from the Uttar Pradesh Police on the circumstances leading to the arrest of the boy. Later, in March 2015, Section 66-A of the IT Act was struck down by the Supreme Court deeming it unconstitutional. On 3 October 2015, Khan made a comment saying that Bharatiya Janata Party MP Mahesh Sharma should be arrested for conspiracy to commit the murder of a man for eating beef in the Dadri village of Bisara. Suspended IPS officer filed a case against Azam Khan in CJM court Lucknow on account of indecent comment on 30 November 2015. He was appointed as the Chairman of the Maha Kumbh Mela committee by the U.P. Chief Minister. More than 30 million pilgrims took the holy dip in the Ganges River and returned home safely. However, almost forty people died in a stampede at the Allahabad Junction railway station (which was actually located outside Kumbh Mela premises), leading to Khan announcing his resignation on "moral grounds". Akhilesh Yadav, then the Chief Minister of U.P. rejected Khan's resignation, praising the minister and declaring that Khan was not at fault. On 15 November 2015, Azam Khan made a number of statements (below) about the November 2015 Paris attacks. The Paris terror attacks were the result of the action of global superpowers like America and Russia and "history will decide who is a terrorist." We condemn the Paris attack, we also condemn the attacks on oil-bearing countries by America and Russia. Iraq, Afghanistan, Libya, Syria and Iran were destroyed in these attacks. We should first see who killed the innocents first and who retaliated. Whoever kills innocent people, whether it is America or Russia or any group, is wrong. Killing innocents whether in Syria or Paris is a highly deplorable act and the whole world should condemn it. But then, if you created such a situation, you have to face the backlash too. On 28 June 2017, addressing Samajwadi Party activists in Rampur, Azam Khan said excesses by security forces had led to "women in some places chopping off the private parts of Army men". During the campaigning for 2019 Lok Sabha elections Azam Khan made a remark against former party colleague Jaya Prada who had joined the BJP. He said that he recognised in just 17 days that the colour of her underwear was khaki (the colour which is associated with the BJP), in a rally at Uttar Pradesh’s Rampur. Khan's comments were condemned across political circles in India, however he has remained unapologetic about them. Samajwadi party president Akhilesh Yadav downplayed the issue stating that the media didn't favour them(SP), however SP leader and sister in law of Akhilesh, Aparna Yadav reacted strongly and sought stringent action against such an attack on women, irrespective of political standing. In view of the derogatory speech, the election commission banned Khan from campaigning further. Reacting to this, his son Abdullah Azam Khan raised questions if he was being banned for being a muslim. ^ "Azam Khan resigns as SP gen secy". The Times of India. Retrieved 12 February 2013. ^ Bhatt, Virenda Nath (10 May 2009). "Rampuri knives out: Yadav tears into Khan". Express India. ^ "Azam Khan returns to SP". The Indian Express. 5 December 2010. ^ a b "FIR filed against UP cabinet minister Azam Khan". The Times of India. 12 April 2014. Retrieved 12 April 2014. ^ "Azam Khan's foot-in-mouth statements about the Election Commission". 18 April 2014. Retrieved 31 May 2015. ^ "Election Commission Cannot Behave Like God, Says Azam Khan". NDTV. 1 May 2014. ^ "5 controversial comments made by Samajwadi Party leader Azam Khan". india.com. 11 April 2014. ^ "Allah has punished Rajiv Gandhi, Sanjay Gandhi: Azam Khan". The Times of India. 11 April 2014. Retrieved 13 April 2014. ^ "Cops expose Azam Khan's role in Muzaffarnagar violence". 18 September 2013. ^ Vij, Shivam (2 February 2014). "Why UP minister Azam Khan has a 50% chance of recovering his stolen buffaloes". ^ Ghosh, Deepshikha, ed. (4 February 2014). "Azam Khan's stolen buffaloes found, 3 policemen punished". NDTV. ^ "Shias in UP seek Azam Khan's removal". www.oneindia.com. ^ "Azam Khan rakes up a controversy, quips Mulayam Singh's birthday buggy ride funded by Taliban, Dawood". The Indian Express. ^ "Azad from Kashmir, not India: Azam Khan". The Times of India. 23 December 2010. ^ WashingtonApril 26, India Today Online; April 26, 2013UPDATED:; Ist, 2013 10:43. "Azam Khan to cut short US trip as India protests airport detention". India Today. Retrieved 15 April 2019. ^ Abbas, Nazar (19 March 2015). "Day after boy's arrest for Facebook post on Azam Khan, parties protest police 'excess'". The Times of India. ^ "SC strikes down 'draconian' Section 66A". The Hindu. 25 March 2015. ^ "Kumbh Mela chief Azam Khan resigns over stampede". BBC News. 11 February 2013. Retrieved 14 February 2013. ^ "Akhilesh rejects Azam Khan's resignation as Kumbh in-charge". CNN-IBN. 14 February 2013. ^ "Women chopping off Army men's private parts, says Azam Khan - Times of India". The Times of India. Retrieved 28 June 2017. ^ "LS polls: SP leader Azam Khan makes misogynistic statement against Jaya Prada for joining BJP - Times of India". The Times of India. Retrieved 15 April 2019. ^ "Azam Khan: SP leader Azam Khan mocks media, remains unapologetic | News - Times of India Videos". The Times of India. Retrieved 16 April 2019. ^ "Slur on Jaya Prada: Akhilesh goes soft on Azam, 'chhoti bahu' blasts remark - Times of India". The Times of India. Retrieved 16 April 2019. ^ "Azam Khan's son plays Muslim card, says 'EC banned his father because he is a Muslim'". Zee News. 16 April 2019. Retrieved 16 April 2019. This page was last edited on 21 April 2019, at 11:53 (UTC).